Vintage black and white mirror carp fish drawing from 1841. Mirror Carp are most commonly found in Europe. As their name implies, their scales are similar to mirrors. Carp are a large group of different species of fish found throughout Europe and Asia. Many are treasured for their beautiful colors and scales; goldfish are carp. In a slight irony, A Treatise on the Management of Fresh-Water Fish only had this single fish drawing on the title page. The good news for us is that it is a wonderfully detailed mirror carp drawing. I think sometimes, the vintage illustrations done in black and white offer a higher-degree of detail than their colored counterparts. This fish would look even grander with a bit of color tinting. 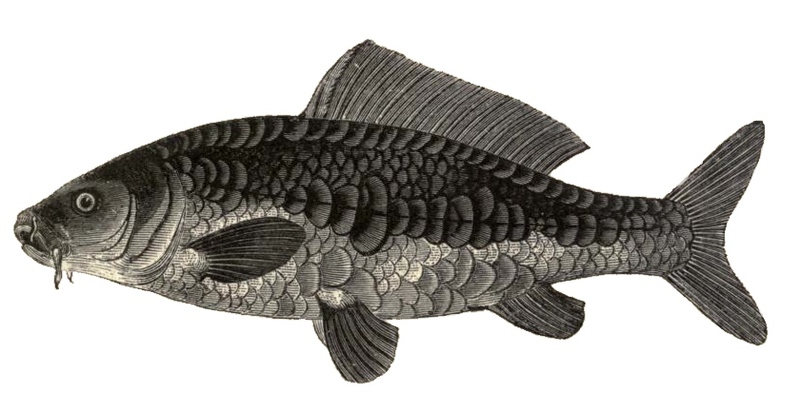 But, I’ll leave it up to you to decide if you use this fish drawing as he appeared in 1841 or if you apply some color. The original version of this black and white fish drawing measures 840 x 433 pixels. If you would like to view and download that version, just click on the mirror carp shown above.